On our first trip to Hawaii, our twin daughters were two-and-a-half. 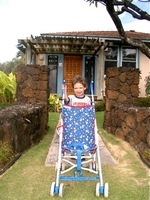 Max in Hawaii. Photos by Effin OlderOn this trip, our grandson Max was two-and-a-half. Max’s mother, Willow, and her sister, Amber, were now 35. And his young sibling, Babybrotherben, just turned eight months. On the first trip, we four — Effin and I and our twin daughters — stayed in a cottage at Puunalu on the (then) largely undiscovered north side of Oahu. This time we eight (add Willow’s husband Leroy and our dear friend Barbara) stayed in a slightly bigger cottage on the south side of Kauai. In some ways travel with kids is harder today. If you intend to drive, you have to lug along awkward, heavy car seats. You have to make your way with kids and car seats and fold-down strollers and disposable diapers through airport security. On the plane, there's much less legroom and even less food. On the other hand, these days you can rent a van, and you can rent or bring along a portable DVD to keep the kids amused. Halfway through day three, the whining abruptly stopped. Max was suddenly happy in Hawaii. That’s when Babybrotherben got hot. Hot and cranky. And running a temperature of 102. Followed by spots. Roseola. Confronted with not one, but two crying nephews at the start of her Hawaiian vacation, Aunt Amber announced she was reducing her own future baby plan from two to one. Or maybe she’d just keep her cat. As for the grandparents, it had been so long since we’d traveled with young kids, we had to make some adjustments of our own. For instance, I'd automatically brought along a hydration backpack for the hot-weather hikes I'd assumed we’d take. Negatory. No hikes. Ditto, long bike rides. Ditto, any bike rides. It wasn't until day four that we got in half an hour’s snorkeling. We, who were so accustomed to roaming free, suddenly rediscovered the TTYO — the tyranny of the two-year-old. You're on his schedule, not your own. You walk to the beach at his pace, not yours, and stop along the way to see the monk seal, to play on the playground, to run around the trees, to ogle the chickens. The chickens. Kauai is rich in free-ranging, queen-of-the-road, exotically colored chickens and their adorable young broods. And, for better and worse, their mates. “When the rooster crows at the break of dawn…” was probably written on Kauai. The island roosters — and there are at least 740 of them under my window, alone — all crow at the break of dawn. And worse, much worse, before the break of dawn. I still don’t know whether the four air-gun shots I heard on day two were real or merely wishful dreaming. In the end, we adapted. We lived at Max’s pace and simply gave up hiking and biking. And while I'd forgotten that giving-up part of travel with young kids, I'd also forgotten some of its great pleasures. We’ll bike another time. This is good enough .